It was Little Zs Pre-school parents evening this week and I was secretly very excited to see “The File”. Its a big file that the keyworker puts together throughout the year, journalling all their little and big milestones and you can eventually take it away and keep. It’s assessed against the curriculum set for pre-schoolers. It’s slightly baffling to think that children aged 3 and 4 now adhere to a curriculum too and I wasn’t too bothered about that bit of it, I just wanted to read about all the things he has been up to, even though I get told each time we visit. The file was a brilliant read. It stepped through each month showing such an interesting journey, some of which I’d totally forgotten about. It recorded things like the first time he’d plucked up the courage to ask for bubbles to the first time he found his own little group of friends to the times when he started narrating along to stories and all the countless times he has declared he was a superhero. He has gone from saying he plays with “children” to having proper friends, his first real friends that are not his cousins and knowing things about their life and families. As well as sometimes disclosing a bit too much about them as little kids tend to do. All of his little gang are going to different schools and we keep reminding him of this in the gentlest way possible. He’s now accepted it, I think and hopefully that hole will be filled very quickly with new friends. He has grown so much over the last couple of years and I love that he is a late leaver. That extra time in pre-school has helped him build up his confidence and he has really fallen in love with pretty much all his keyworkers who are genuinely caring and seem to possess the patience of about 10 saints each. I was sat on one of those teeny tiny kiddie chairs as a handful of children were screaming at probably the highest pitch known to humankind, non-stop. I kept glancing over hoping they would calm down for a few minutes before my ears fell off. Little Z’s keyworker was SO un-phased by it all, including anytime a little one threw their arms around her for an impromptu hug. I want to be THAT woman. Patient and completely un-ratty. I really think keyworkers could rule the world with their skills and calmness and just zen-like aura. They have eyes in the back of their head and are so hard working, juggling looking after children to doing daily and weekly reports on each of them. I’m not sure what they do when they have a day they’re not feeling very energetic. I’m guessing they can’t sink into their chairs and just check email. As I flicked through his file I could see he’s gone from the shy clingy little toddler that would clutch onto my leg sobbing to the confident boy that now waves me off and goes to find some friends to play with. The little boy who has gone from standing on the side lines to joining in whole heartedly in a game of football and one who will practice his skills at home all on his own. For alot of the skills assessed he is in his age range or a tiny bit higher. For his letter writing he is in the “age 4” bracket indicating he’s ever so slightly behind the curve, possibly. It is still a challenge to get him to sit down and practice his letters and numbers so that is our summer mission so that he has the best start into reception class and its all a bit less daunting for him. There is a part of me that worries about how he’ll be when he starts school and having our parents induction almost straight after his pre-school parents evening made the whole day slightly overwhelming. The school is brilliant in its structure and his teacher was so bubbly I am sure Little Z will love her. She is due to visit us at home very soon and I’m hoping that first meeting will be the best first step for him into the next chapter of his life. That chapter has come round way too quickly but I’m very grateful I got a bonus year with him. He seems mostly ready for the big school world and I think we will need to make the most of the next 12 weeks before our next adventure starts. 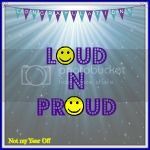 If you’d like to link up to Loud n Proud then grab the badge and enter your link into the linky below. The link will stay open till Sunday night so you have plenty of time. It would be lovely if you could visit one or two of the others too! Then come back next week when your friendly host for the week will be Suzanne from 3 children and It. This entry was posted in Toddler and tagged Growing Up, keyworkers, moving from nursery to school, parents evening, pre-school. Bookmark the permalink. This is such a lovely post! I felt almost tearful reading about his progress! It sounds like he will be more than ready for school. I know what you mean about having an ‘older’ child and having that extra year – I have an October child and a late June child and school came for too quickly for my June child! It’s fantastic that the teacher visits you at home. This reminds me a bit of my boy starting secondary – he had a teacher visit him at school last week and he’s going without his friends too. Nikki Thomas recently posted…No more carpets! Aww! How lovely! I still have my girls “files”….It’s such a great way to see what they are up to when you are not there! It’s fascinating to see how many little moments get capture in ‘the file’. It makes for an interesting record of a period of time of great change in their lives, and I was always keen to find out more about aspects of the kids at preschool that we don’t always see at home . (Although, to be fair, I’ve always picked them up from preschool often enough to get a good sense of how they are.) It’s interesting to skim back through this and chart those developments, though. Oh this reminds me so much of my T. I will be looking out for how little Z gets on in September. We got out ‘Goodbye’ letter from nursery on Tuesday – Cried before I even read it!